I was up in the east side at a great time for wildflowers. One area that really impressed me was at Agnew Meadows in Devil’s Postpile National Monument. In one place — a boggy meadow beside a stream — I counted a dozen different wildflowers in full bloom within a twenty foot radius, and I was impressed at how well the colors all complimented each other, purples and blues contrasted with yellows. 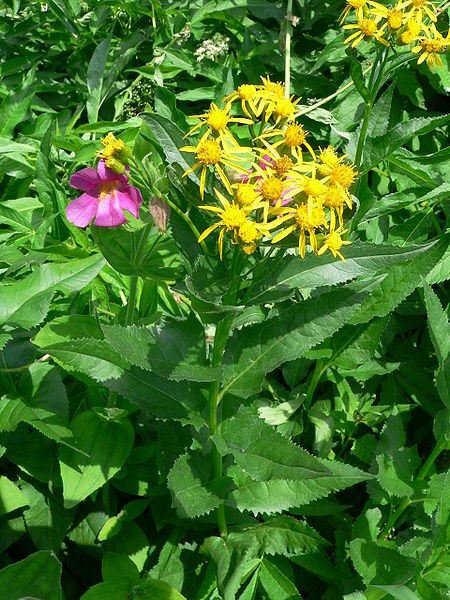 I saw the same flowers growing together in various combinations at many of the other meadows and streamsides in the monument and in the national forest, but because they were all present at once in Agnew I started to think of them as the Agnew Meadows wildflower mix, as if it were a seed company’s wildflower packet. For a moist cottage garden at high elevation, I reckon you couldn’t do much better. 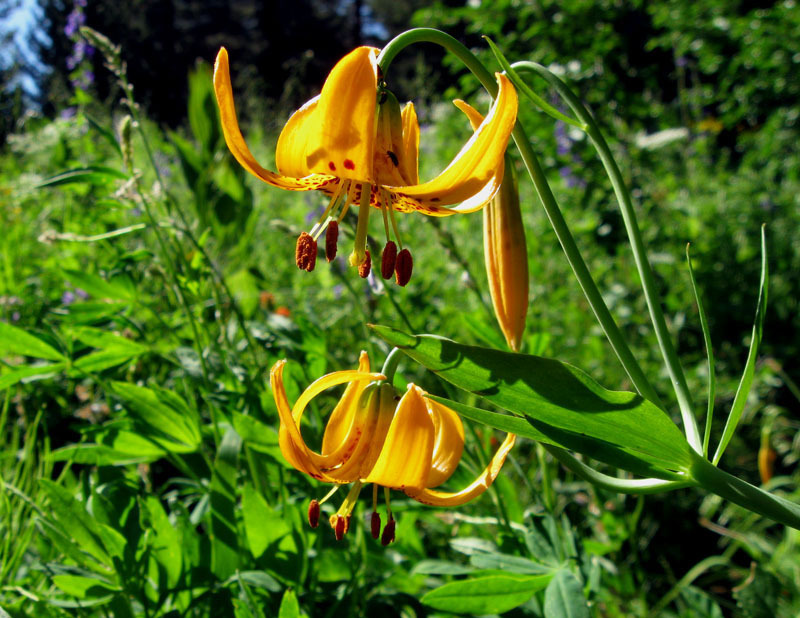 Sierra Lily, aka Kelly’s Lily (Lilium kelleyanum), was the star, providing the biggest and boldest show of yellow. Monkshood (Aconitum columbianum) was one of the staples for purple and blue. It frequently grew with Mountain Larkspur (Delphinium glaucum), and was relatively indistinguishable to me from a distance. 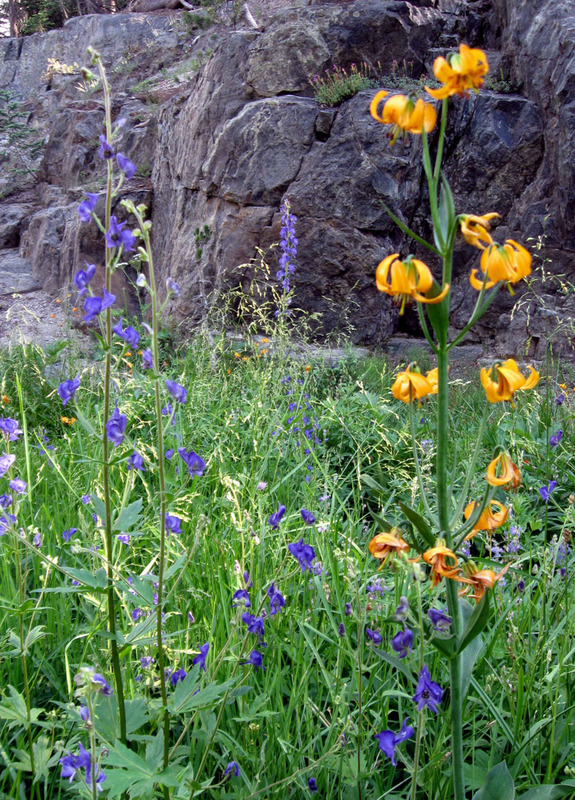 Up close, though, the monkshood flower has its cool looking cap, and the larkspur has its distinctive spur. The Corn Lily had mostly bloomed earlier in the season, but the leaves add a nice texture. They were starting to die-back in some of the drier areas by mid-August. 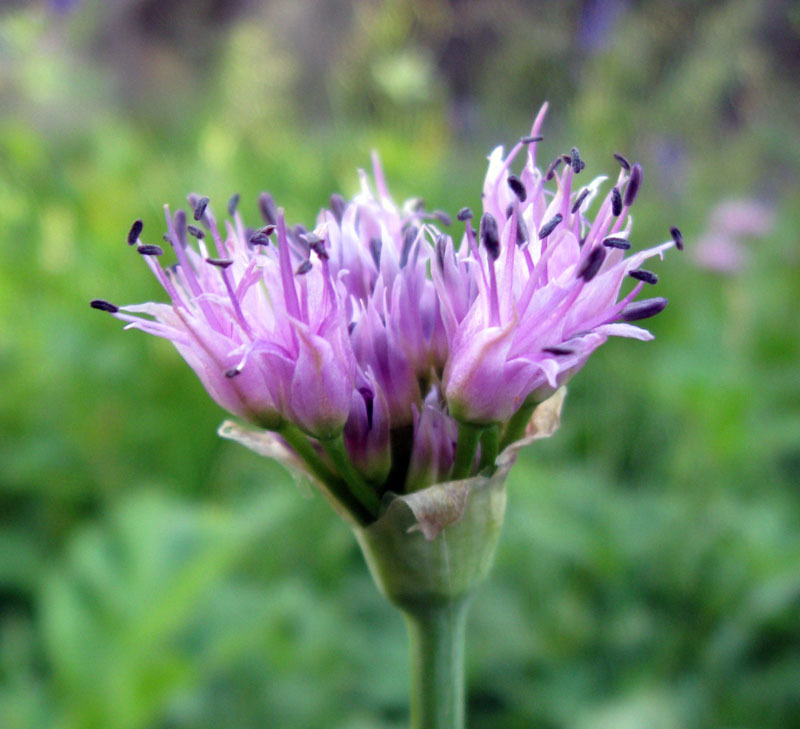 Allium validum was growing in the middle of some of the streams, as well as in the meadows. The Senecio was all over the place. Alpine Goldenrod was also widespread and has a somewhat nicer yellow, probably the nicest of the yellows after the Sierra Lily, but I didn’t get any pictures of it. I would definitely include it in the Agnew mix. 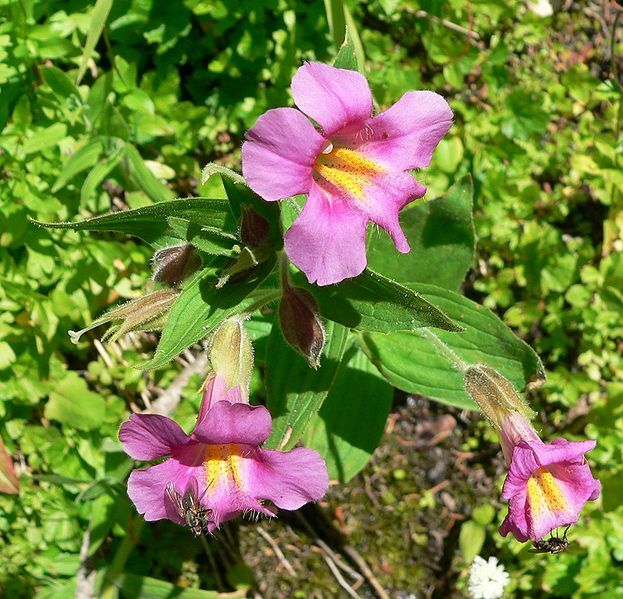 Mimulus lewisii grew in some mono-cultural patches as much as ten feet wide. Seep monkeyflower (Mimulus guttatus) also grew in the meadows, though it tended to get a bit swallowed up by the other vegetation. L. polyphyllus is the main ancestor of the garden lupins. There were a few other bluish purple flowers, Meadow Penstemon (Penstemon rydbergii) which grew at the fringes of the meadows, a few Jacob’s Ladder (Polemonium occidentale) somewhat hidden amongst all the growth, and Fireweed (Epilobium angustifolium) whose color matched nicely with the Allium. 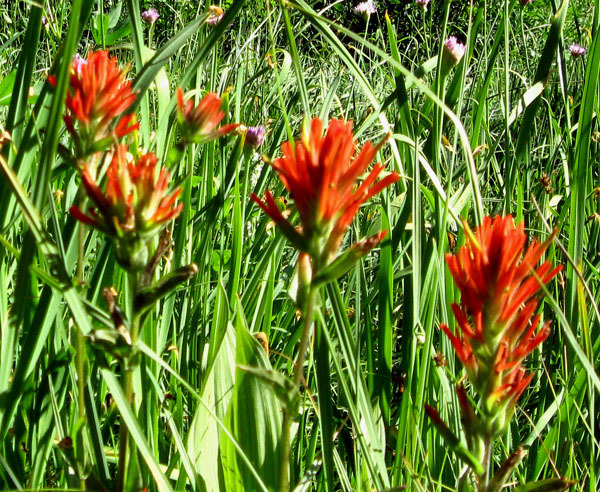 I’m not sure that the red of the paintbrush fits perfectly into the color composition, but it was widespread and thriving in all of the meadows. In dry areas, the paintbrushes (a hemi-parasite which latches onto the root systems of other plants) clearly favored the Artemisias as a host, but in these wet meadows the growth was too dense to know for sure what the paintbrush was latched onto. 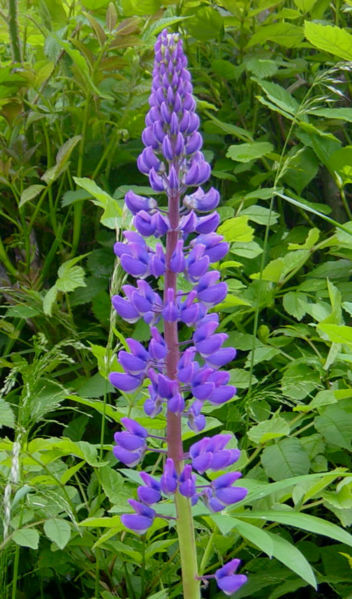 A study in Colorado found that the plants grew best with the lupins, not just because of the nitrogen fixing and vigor of the lupin but also because of unpalatable alkaloids that the lupins pass to the paintbrush; herbivores which didn’t like the taste of lupin tended to also not like the paintbrush that was parasitizing it. But it was impossible to tell what the paintbrush was parasitizing in this meadow, and everything was growing so lushly and exuberantly that I wouldn’t draw any conclusions anyways. A fertile place. There were of course other nice wildflowers that I’m not including. The Park System did a survey of all the plants in the monument and lists what subspecies they are. Photos of quite a few of them can be found here. This entry was posted on Monday, September 7th, 2009 at 8:52 am and is filed under california natives, plants, wildflowers, wildlands. You can follow any responses to this entry through the RSS 2.0 feed. You can leave a response, or trackback from your own site. Ah, that’s why we didn’t see any wildflowers at the higher elevations over July 4 weekend. Should have been more patient. Love the mix, especially the lily! Wish I could elevate the garden by a few thousand feet…Well, maybe not. Don’t like snow. That lupine is incredibly beautiful. Great color, and great pic. I’m new to your blog. How delightful to read about Agnew Meadows. My husband and I used to go fishing in Mammoth every summer for years. We haven’t been there in ten years, and I’m thinking it’s time to go back! Thanks for the great photos! Thanks. Agnew Meadows is a great spot and I was there at the right time for wildflowers, late July to late August. I heard that the wildflowers were a bit later than usual this year because of some late rains. 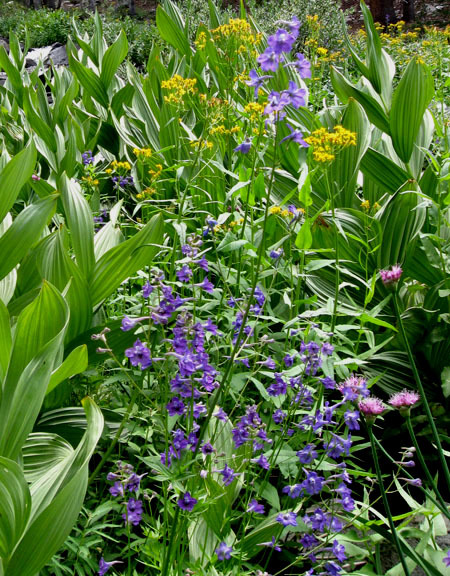 Interesting how with all the colors out there the monkshood and larkspur double up on on the same color, like the fireweed and allium sharing the same color. Same pollinator, maybe? So many of our flowers around here are almost the exact same shade of yellow in the spring, and I heard the bees prefer that color. If they’d grow well here, yours is a mix I’d buy. Very cool. Thanks for commenting. I hadn’t looked at this post in a while. It’s a great place. I wish I could go there this summer.